Cardamom farmers in Guatemala brave destructive pests, deadly snakes and predatory markets to grow and sell one of the world’s most expensive spices. They often reap very little profit from their hard work, but Heifer is helping to change that. ALTA VERAPAZ, Guatemala — Near the end of the morning, Miguel Xo Pop walks alone, starting a lengthy descent from his home in the Sierra de las Minas mountain range. His view would be stunning — tall, wispy trees and dense foliage covering miles of undulant peaks ahead and behind — if not for the blanket of fog that covers everything in the cloud forest. Because the cardamom and coffee crops aren’t enough to support his family this year, Miguel Xo Pop makes the long journey to work on a melon farm. There’s a good chance Xo wouldn’t have noticed the view anyway since he’s in a hurry; today, he has a ride to catch. After walking many miles, Xo will hop in a crowded truck on its way to another part of the country, where Xo will work on a melon farm. For the next month, he will perform manual labor for 8 to 12 hours a day. The farm’s owner pays him and the other workers 45 quetzales ($5.89) for an 8-hour day, despite the fact that the Guatemalan minimum wage is 75 quetzales ($9.82). Overtime nets five quetzales ($0.65) for each hour. This has become his routine: three times a year, in February, June and August, Xo spends a month working away from his home. Sometimes he finds himself on a melon farm, but he has also put in hours cultivating sugarcane, palm oil and bananas. Back in the mountains, Xo farms his own plot of land. Everyone in the Sierra de las Minas depends on two crops, cardamom and coffee, to survive. Xo and his family are no different. 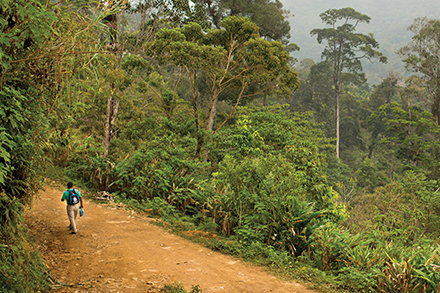 Traditionally, the cloud forest’s climate helps the two plants thrive, but in the past few years a pair of plagues cut cardamom prices in half and reduced coffee income to nothing. Cardamom is a high-priced spice, usually referred to as aromatic because of its strong, distinctive smell. Known as “the queen of spices,” the seed has a complicated flavor — sometimes described as mint or menthol, sweet, spicy, eucalyptus, floral or citrus. The spice belongs to the ginger family, and its taste is just as intense. The plant originated in southern India, and the biggest demand for the spice is found in Southeast Asia and the Middle East. Cardamom is also popular in Scandinavia, where the Vikings introduced it about 1,000 years ago. Besides adding flavor to dishes, cardamom is used as a breath freshener and digestive aid. Recently, Xo joined a Heifer International Guatemala project that will help him keep the pests away from his cardamom while adding more crops to his farm, but the project is still in its initial stages, gaining momentum. So for now, Xo spends a quarter of a year away from his wife and five kids to earn money. For the month, Xo left his family 700 quetzales ($91.64) and 100 pounds of corn, which seems like a lot of corn until Xo explains that the family typically eats 300 pounds of corn monthly. The money will be stretched to purchase beans, rice, soup, chili, salt and cal (calcium hydroxide, for the preparation of tortillas). “It’s hard to leave them because I don’t know if they will be able to eat,” Xo said. “It happens every time.” On the days there isn’t any food, Maria Juc Caal, Xo’s wife, has to take out credit. The concern goes both ways. While he’s gone, Juc worries about Xo getting into an accident on the road. Xo’s absence also increases her burden around the house. Just before Xo walks through the clouds and down the mountain, his wife and his youngest child, nine-year-old Cecilia Carolina, give send-off hugs. It’s not a teary goodbye, which is sad in its own right; the trips are normal now. Xo’s story is the story of most of the families in the mountains — the men leave for seasonal labor, and everyone else picks up the extra slack at home. Manuel Pop Caal lives in the community of Los Angeles in the Sierra de las Minas. Income from selling cardamom and organic coffee used to cover most of his family’s needs, with cardamom providing 60 percent and coffee the other 40 percent. But over the last few years, a fungus called coffee rust reached epidemic levels in Central America, decimating harvests. Experts say the fungus may be benefitting from climate change and warmer temperatures in higher altitudes, where coffee grows best. Whatever the cause, Pop saw the fungus cut his typical harvest in half in 2014. This year, there will be no coffee harvest for Pop or anyone in this part of the cloud forest. To make matters worse, the cardamom harvest is also under siege. Thrips, slender but destructive insects, intensified in the past several years. Thrips attack a cardamom plant starting at the flowers, scarring them in the process. The scarring then moves to the seed, the part of the plant that’s harvested for profit. Unlike the fungus coffee rust, thrips don’t destroy a harvest. But the seeds are left visually unappealing and less aromatic, and buyers will only pay half of what they would for healthy cardamom. So Pop supplements his family’s income by working on a palm oil farm that’s a 10-hour journey from his home. “Palm oil work is harder (than cardamom),” Pop said. “I have to wake up at 3 a.m. for breakfast. It’s a stricter work schedule.” He added that it’s hotter and more humid there, and his body, used to the cool temperatures of the cloud forest, struggles to acclimate. That doesn’t mean cardamom farming is easy. During the harvest season, the cardamom seeds are handpicked and sorted, packed in burlap sacks, then carried down the mountain to the edge of the nearest town, La Tinta, for sale. Farmers carry their produce on their backs using a mecapal, a sturdy piece of material that rests on the wearer’s forehead on one end and cradles the bottom of the sack of cardamom on the other. Users, which include men, women and children, have to have strong shoulder, back and—especially—neck muscles. “(You can carry) 175 pounds if you’re really good,” Pop said. In a day, he might have to haul his cardamom nearly five miles, or for about an hour and a half, to get to buyers. Manuel Pop Caal examines his cardamom crop. In addition to the exhausting work, cardamom farmers face a fair amount of danger. Before the harvest, many cardamom growers on the mountain range invite a Mayan elder to perform mayahac, a ceremony asking Ajaw, the all-powerful creator of the universe, to bless the harvest. It is also common to ask Ajaw for protection, specifically from the barba amarilla (“yellow chin” in Spanish), perhaps the most feared snake in Latin America. After the harvest, cardamom farmers tend to their plants by pruning the dead leaves and removing accumulated detritus from the base of the shoots, and sometimes the aggressive and venomous pit viper, also known as the fer-delance, is waiting underneath. For this reason, no one in the Sierra de las Minas enjoys postharvest chores. The trials of cardamom farming aren’t limited to manual labor, plagues and snakes. One of the frustrating truths about cardamom is that small-scale farmers struggle financially despite the commodity’s status as the third most expensive spice in the world by weight, after saff ron and vanilla. Originally from India, cardamom arrived in Guatemala in 1914 via German immigrants, and it adapted well to the environment. Today, Guatemala produces more cardamom than any other country, generating more than $300 million a year. Locally, it’s known as oro verde — green gold. On a market day, as many as 1,000 farmers like Xo and Pop carry their harvested pods from the mountains to a bridge that marks the outskirts of the town of La Tinta. Middlemen, known as coyotes in Spanish, weigh the bags of seeds using scales in their truck beds and pay the farmers in cash on the spot. Producers have little negotiating power, and often coyotes take advantage of that. “In the market, intermediaries will lower the price (of cardamom), put the price however they want,” said Elvira Pec Beb, a cardamom farmer from the Sierra de las Minas. If the price is really bad, Pec will sometimes skip the middlemen and sell directly to the next rung in the ladder, the dryer, for a better price — but that’s a rarity since she has to find transportation for the half-hour trip by truck. So normally, Pec and other farmers must sell to coyotes, who profit from selling the cardamom to drying facility managers for a higher price. Managers will buy healthy cardamom for two quetzales ($0.26) per pound, dry the seeds in a dark, heated room over a 50-hour period, then send the cardamom to the owner, who most likely owns more than one drying facility. The dried cardamom is then sold for seven quetzales ($0.91) per pound to exporters who raise the price further when selling to customers in India, the Middle East and other places where the spice is in high demand. Globally, the commodity sells for $5 or $6 per pound. By the time cardamom reaches stores in the United States, it can sell for at least five times that. Glue traps have been effective for Rolando Yat Tut. The bright side is that Yat actually does have healthy cardamom, increasingly a rarity on the mountain range. 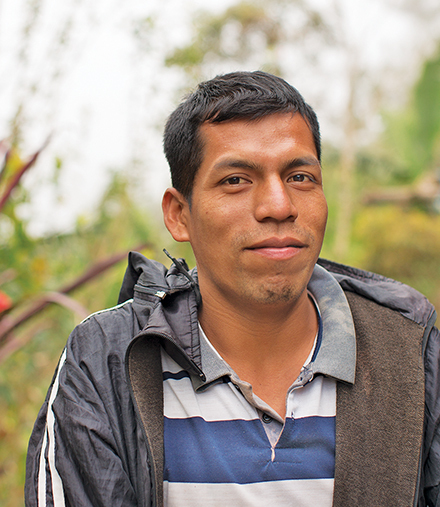 With the help of Heifer Guatemala, Yat is lessening the impact thrips have on his plants. The approach starts simply, with a yellow piece of plastic. The square, a trap suspended among Yat’s cardamom plants, is dotted with thrips. As it turns out, the insects are attracted to certain colors — yellow especially — and when they land on the trap, glue keeps them from leaving. Combine that with biopesticide, derived from natural ingredients, and Yat’s harvests are increasingly more productive. Yat is a member of the Association of Organic Producers for the Holistic Development of Polochi (APODIP), which began as an association of coffee farmers, but most of the members rely more heavily on cardamom. As coffee rust became more and more devastating, APODIP sought out a partnership with Heifer Guatemala to strengthen cardamom production and fi nd complementary products for its farmers to cultivate. According to the Heifer Guatemala’s research, families in rural parts of the country need $4,174 annually, on average, to cover basic needs of food, clothing, shelter, education and healthcare; however, most cardamom farming families only earn about one-fourth that. Heifer Guatemala’s goal is to bridge that gap and help families move themselves into a place of resiliency. Manuel Pop Caal poses near his cardamom plants. The first step in the project is finding sustainable and inexpensive ways to ward off thrips. Although the pest control methods used so far are effective, the biopesticide, at $10 per ounce, is too expensive for farmers to buy on their own. Heifer Guatemala is trying to find alternatives that farmers can afford or, ideally, make themselves. To that end, “research, development and innovation” became Hernandez’s mantra for the project, and a disparate group of organizations were enlisted to help. Heifer Guatemala is working with Texas A&M University and Guatemala’s Universidad San Carlos to examine the pest control issue, as well as ways to reduce the excessive amount of firewood used by cardamom dryers. Heifer Guatemala is also seeking out new ways to use and market cardamom. Already, the farmers are building relationships with The Doug Jeffords Co., a Tennessee-based spice vendor, and Kardamomuss, a fusion restaurant in Coban, Guatemala, that specializes in using cardamom in its dishes. The United States accounts for only two percent of the world’s cardamom use, and in Guatemala, the spice is almost never used. Hernandez would like to see both countries adopt more cardamom recipes, and Heifer Guatemala is working with its partners to see if cardamom products like iced tea or toothpaste could be viable in the marketplace. Heifer Guatemala also hopes to find alternative sources of income so farmers can supplement the cardamom and coffee harvests. One of the first products introduced was honey. Although families in the Sierra de las Minas don’t traditionally consume honey, they can sell it for about 66 quetzales, ($8.50) per liter in the towns below. With the support of Heifer Guatemala and its partners, some farmers are supplementing their income through the introduction of poultry and crops that grow complementarily with cardamom — black pepper, nutmeg, cinnamon, the native chile cobanero and the ghost pepper, known for its spiciness. One of the biggest challenges, set for later stages of the project, is connecting farmers directly with domestic and international buyers so families don’t have to settle for the prices of the coyote monopolies. Miguel Xo Pop, in his home in the Sierra de las Minas mountains. After four weeks of work on the melon farm, Miguel Xo Pop will return home with extra cash in his pocket to pay for some of his family’s expenses. But he will also return to a farm that shows more promise every month. Not only has the health of the family’s cardamom improved with each harvest, but with help from Heifer, Xo introduced a series of new crops — cloves, peppers, cinnamon — into his fields. The cinnamon is particularly productive, and he would like to add more in the future, as well as a nursery. It’s his hope that these and other improvements will be the beginning of the end of his triennial trips away from his family. In time, extra income from the project could help the family with more than just the necessities. Maria Juc Caal would like to keep her children in school to open opportunities later in life. Cecilia Carolina, in particular, wants to be a teacher when she grows up. All of the J.M. Thomason spice blends can be purchased online or at select retail outlets in the South. A couple of years ago, McKinley Thomason was searching for a way to use his Nashville-based spice business to make a positive impact. After hearing about Heifer International’s burgeoning work with cardamom, he knew he had found his organization. Shortly after contacting Heifer, Thomason’s company, The Doug Jeffords Co., started donating 10 cents to Heifer Guatemala for every seasoning blend sold from their J.M. Thomason line. 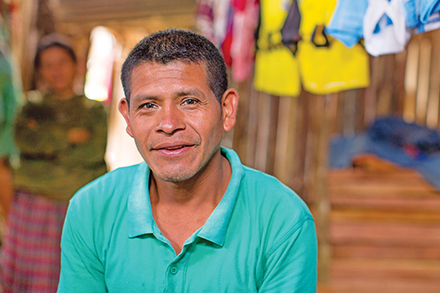 But Thomason’s passion for Heifer’s work in Guatemala moved him to do even more. Thomason has been acting as a project adviser to Guatemalan farmers, sharing his market knowledge and technical expertise in the world of cardamom. He is also making connections and introducing Heifer Guatemala to other like-minded spice companies that could support this or other projects. Starting last summer, the J.M. Thomason brand introduced three new spice blends: Gaucho Espresso, Parisian Pastry and Garam Masala. For each tin sold, 25 cents is donated to Heifer Guatemala. Additionally, all of the cardamom (Parisian Pastry, Garam Masala) and coffee (Gaucho Espresso) used in the blends are grown by farmers participating in the project and sold directly to Thomason’s company. The direct relationship cuts out the coyotes and nets farmers a better price.